CHARLOTTE, N.C. — The city’s deputy fire chief is being questioned by LGBT advocates after he allegedly shared what they call an offensive and derogatory Facebook post. The post and advocates’ responses come as Charlotte is currently debating whether to approve LGBT-inclusive non-discrimination ordinances. UPDATE (Feb. 24, 2015, 9:12 a.m.): Dulin has been placed on administrative leave and has apologized for the Facebook post. On Feb. 14, Charlotte Fire Department Deputy Chief Jeff Dulin shared a Facebook post featuring Bruce Jenner. The former Olympian is rumored to be undergoing a gender transition, though he himself has not confirmed them. On one side of the image, Jenner’s original 1976 Wheaties cereal box is shown. 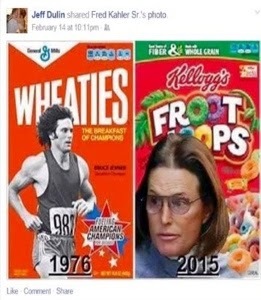 On the right of the image, a more recent, feminized photo of Jenner is photoshopped unto a Fruit Loops box. “I’m pretty offended. That’s pretty bad,” Paige Dula, a local transgender activist and educator, said after seeing the Facebook photo. Dula, a leader in the local Charlotte Non-Discrimination Ordinance Coalition, called the photo “childish” and “derogatory,” especially for transgender people. “It shows what he thinks of transgender people or the LGBT community in general — that we’re to made light of,” Dula said. Dulin, who has apparently taken down the Facebook post, steps into an increasingly divisive debate on transgender equality as the city considers several non-discrimination ordinance changes. Opponents to the proposals, which includes an update to a public accommodations ordinance, have focused their attention on transgender people, unfairly painting them as sick or mentally ill and linking them to sexual predators. Dula said it was disappointing a city official would choose to target a minority, especially when emotions are already running so high. “I would expect a lot higher of a city official, especially a high-ranking city official to not post something like this at any time, but especially now given the debate going on with the non-discrimination ordinance,” she said. Dula is calling on Dulin to make a public, formal apology. Neither Dulin nor Fire Chief Jon Hannan were immediately available for comment. Charlotte Fire Department’s public affairs office referred us to the city’s communications staff. Similar criticisms were lodged late last month after a local TV anchor also commented on Jenner’s rumored gender transition. It saddens me deeply to read that the deputy fire chief of Charlotte, NC posted what I consider not only derogatory but also distasteful commentary . I will say much more about this on Monday – but this only galvanizes me to continue to speak out relevant to transgender issues. be.Yes it is sad, very sad to see that a deputy fire chief, who is supposed to be a leader in the workforce and a man of respect, could be so cold to another person. But we as a transgender community know there will always be people like this in the world, no matter what kind of job or upstanding citizen they are supposed to be. Yes it is sad, very sad to see that a deputy fire chief, who is supposed to be a leader in the workforce and a man of respect, could be so cold to another person. But we as a transgender community know there will always be people like this in the world, no matter what kind of job or upstanding citizen they are supposed to be. Yes it is sad, very sad to see that a deputy fire chief, who is supposed to be a leader in the workforce and a man of respect, could be so cold to another person. But we as a transgender community know there will always be people like this in the world, no matter what kind of job they have or upstanding citizen they are supposed to be. I find Dulin’s Facebook posting callously insensitive and derogatory. ” as impartial and non-discriminatory in carrying out their duties. As such, both cases should be addressed in the same manner. Perhaps it is time to send staff at the Fire Department to apparently much needed, “sensitivity training”. Bruce Jenner has his own problems. Leave the man alone. Not every man can say they won a gold medal in the Olympics. If Bruce is really transitioning I wish him well. Let’s practice some Christian love towards the man instead of Christian hate! Oh, so they can’t put out fires or save a life because they “believe” Bruce Jenner is whack in the head. You believe what you want and stop telling other people what to believe. You scream “Bigot, Bigot” when in fact you yourself are intolerant to others opinions. Guess what,… we are all bigots. If not then you must tolerate my opinion as well. So are you a bigot? Have you ever stopped to think maybe you calling him derogatory and insensitive is in fact derogatory and insensitive to him? No, you just spout your hate and bigotry toward anyone who doesn’t conform to your way of thinking. But guess what. This is perfect, because the thing is; the Christian thing to do is to project Christ and his loving grace and forgiveness that either you accept or reject. And Jesus is the ultimate fireman who would not want any to burn. If that hurts your feelings, I apologize, but it is the truth. There is after all only one truth. Not many but one. Not everyone is right. Someone is going to be wrong, no matter how opionated one may be. The posts by both Eschert and Dulin were equally offensive, albeit targeted against different sectors of the community. Each of these public service employees have caused, by their in appropriate postings, a portion of the community they are meant to serve to potentially call into question whether they will be impartial and non-discriminatory in carrying out their duties. Firing both individuals is, assuming they have otherwise good records, in my opinion too severe a penalty. The “Charlotte Observer” has suggested that unpaid suspension time, a public apology and attendance at “sensitivity training” would be appropriate — and I agree. How can you tell religions are based on myth? They all preach love while practicing hate. Left to our own resolve humans are basically decent and sympathetic. We don’t need religion in order to be like Christ or Buddha, et al.